Tire Tips for Thanksgiving Road Trips! Tire inflation is the most neglected item of regular auto maintenance, and the consequences can be ugly. For starters, underinflated tires rapidly increase tire wear, which could mean wearing down a set of $400 tires a whole year early. Fuel efficiency also takes a hit more and more as your tire pressure drops—in fact, the Department of Transportation estimates that 5 million gallons of fuel are wasted every day solely due to low tire pressure (ouch). The kicker: Low air pressure is the number one cause of tire failures, which adds up to 260,000 accidents per year. Don’t be a statistic, be a hero. Follow these 10 simple steps for keeping your rubber friends at optimal pressure for your safety and your wallet. Get the gauge. Ideally, you should invest in a digital tire gauge to keep in your vehicle. A standard digital tire pressure gauge will only set you back about $13. 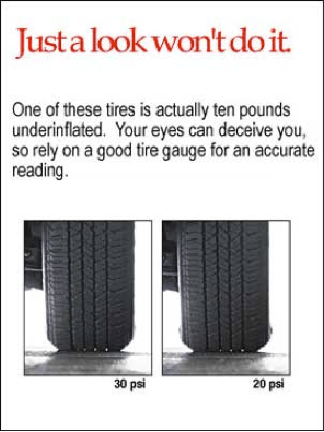 Otherwise, come see us at least once per month to be sure your tires are inflated properly! Know the tire pressure level required for your car. This information is usually on a sticker in the doorjamb on the driver side, and you can always find it in the owner’s manual. Keep in mind that your front and back tires may call for different pressure levels. If you can’t find this information, give us a call or stop by – our technicians are happy to help. Cool down. Wait a little while until your tires are cold before you begin to check their pressure. Tires heat up as they drive, and hot tires will give you an inaccurate reading of your tire pressure. Wait about ten to twenty minutes after you’ve driven. Another option is to check pressure in the morning before you drive. Stash Your Caps. Unscrew all of the tire valve caps on your tires and store them together in your pocket or a safe place where they can’t roll away or get lost. If you do lose caps, be sure to replace them. They’re necessary to protect the valve inside. Check your pressure. Head to the first tire you want to check and press the tire gauge onto the valve stem. You may hear a slight hiss. Hold the gauge in place for a second or so and check the reading on the gauge. Repeat this step with your other tires and note the reading on each. Cozy up to the compressor. If your tires are underinflated, it’s time to use the air compressor. Make sure your car is pulled up close enough to the air compressor so that you can reach all four tires with the hose attachment if needed. Let there be air. Press the hose fitting down on the valve stem of your tire and press the lever attached to the hose to begin inflating your tire. You should feel (or at least hear) the air flowing from the hose into your tire. Don’t overdo it. Release the lever on the air compressor hose after a few seconds and check the reading on the gauge. Repeat as needed until your tire has the required amount of air. Repeat steps 7 and 8 with any other tires that are underinflated. If you overinflate the tire, just press the gauge down just far enough to release some air from the tire. Check it again until it’s at the pressure specified in your owner’s manual. Mark your calendar. When you’re finished, be sure to securely replace the valve caps on all four tires. Now is a good time to mark in your calendar or smartphone the date you checked your tire pressure and set a reminder for your next tire pressure check!